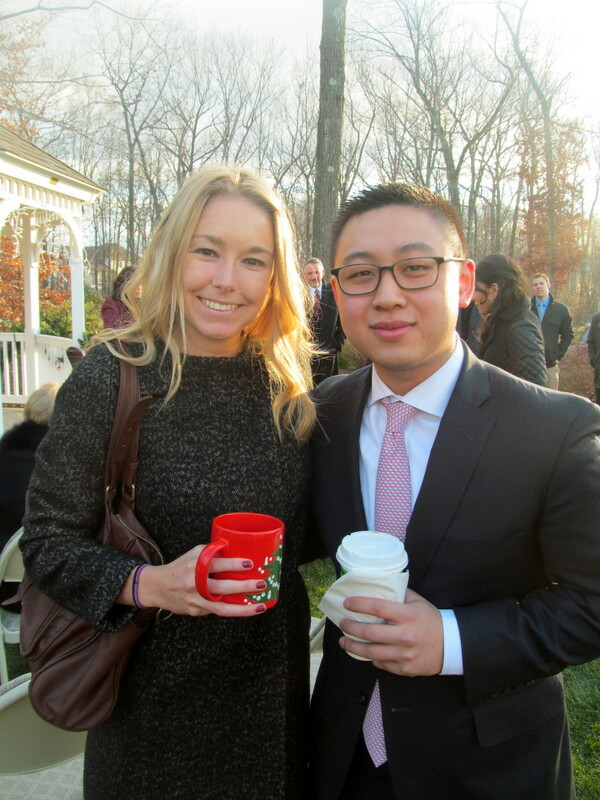 Not-So-Typical Black Friday: A Wedding! As per tradition, I woke up early (well not super early this year, but any alarm set on a day off from work is worth noting) for Black Friday shopping with my sister and Nana Connie. But after our (all too successful) trips to Kohl’s, Old Navy, and the Westfarms Mall (don’t worry I will be recapping tomorrow for Fashion Friday!) 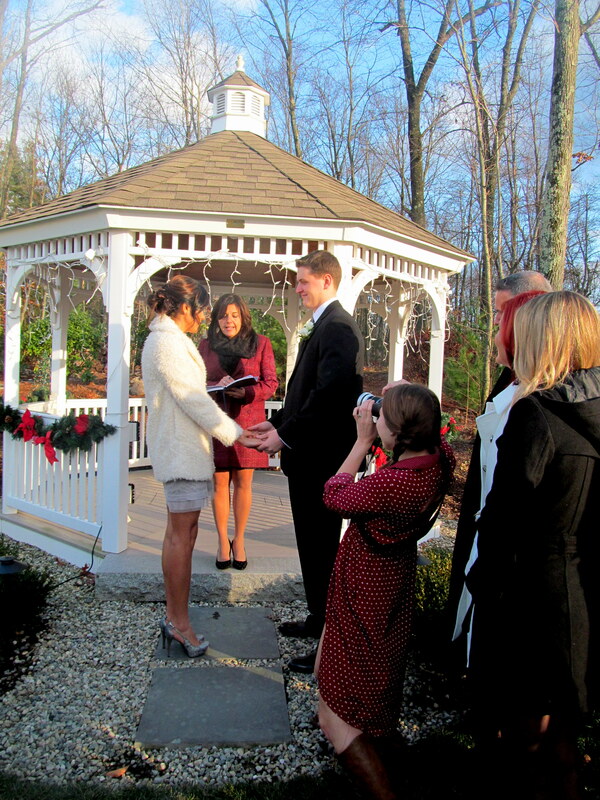 I had some not-so-typical Black Friday plans…a wedding! My good friend from high school Andrea was married to her longtime boyfriend Zack in a quick but intimate ceremony at his beautiful home. 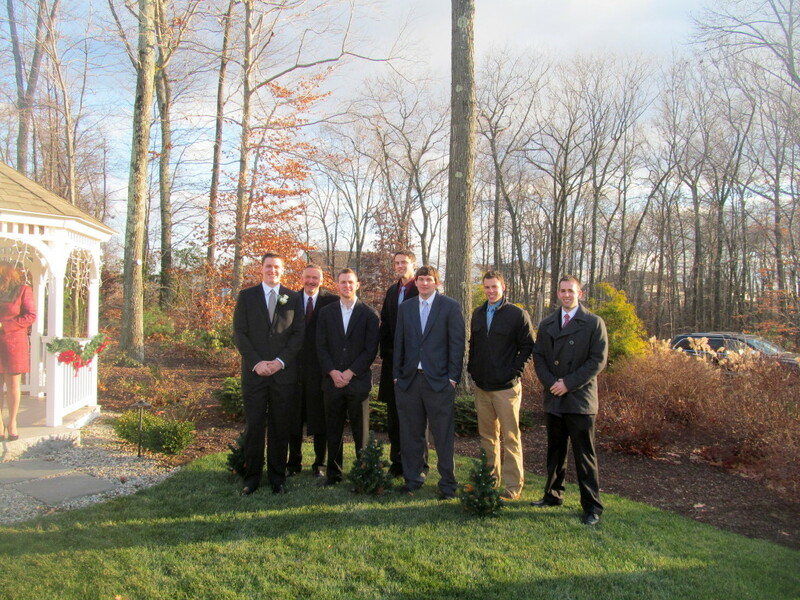 The sun poked out just in time for the ceremony – a good omen! 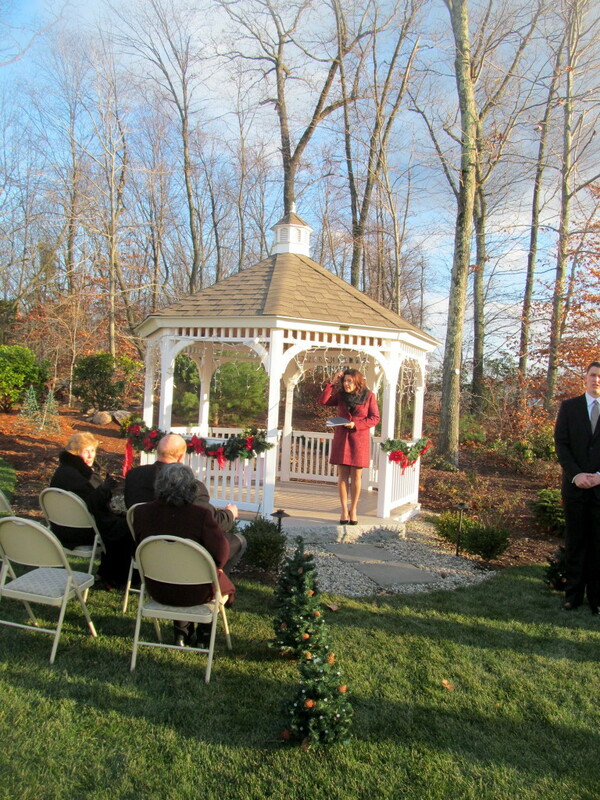 The gazebo in the Bohling family’s backyard was decorated for the holidays and the perfect spot for a late November wedding. I’m getting ahead of myself with those photos. 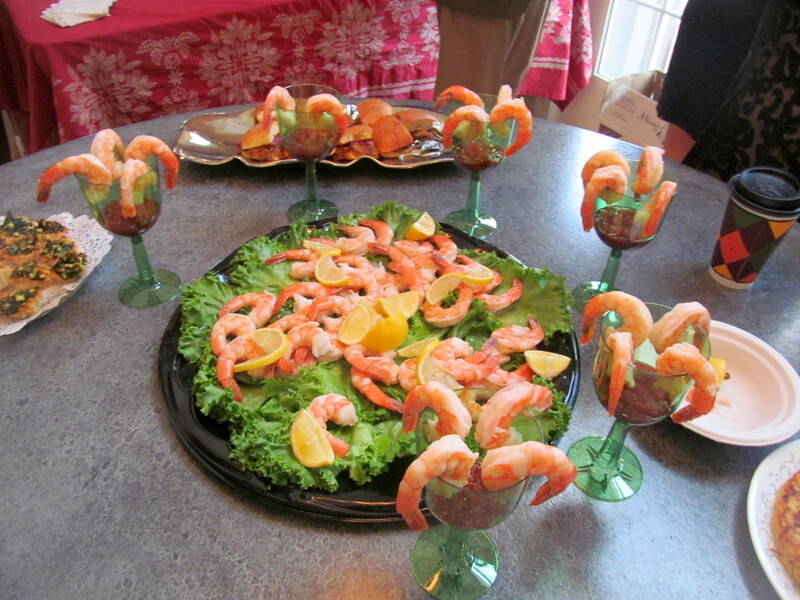 First guests were treated to a fantastic cocktail and appetizer reception. 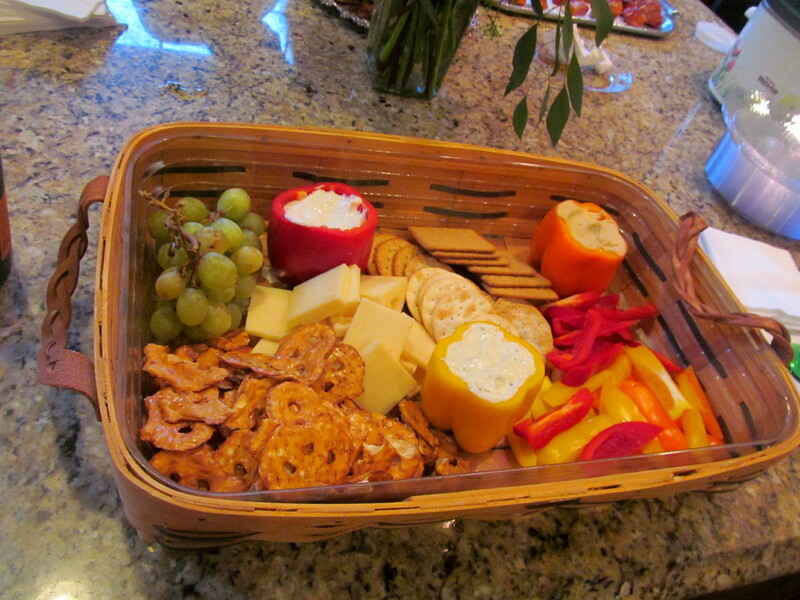 The food and drinks at this wedding were VERY blog-worthy! 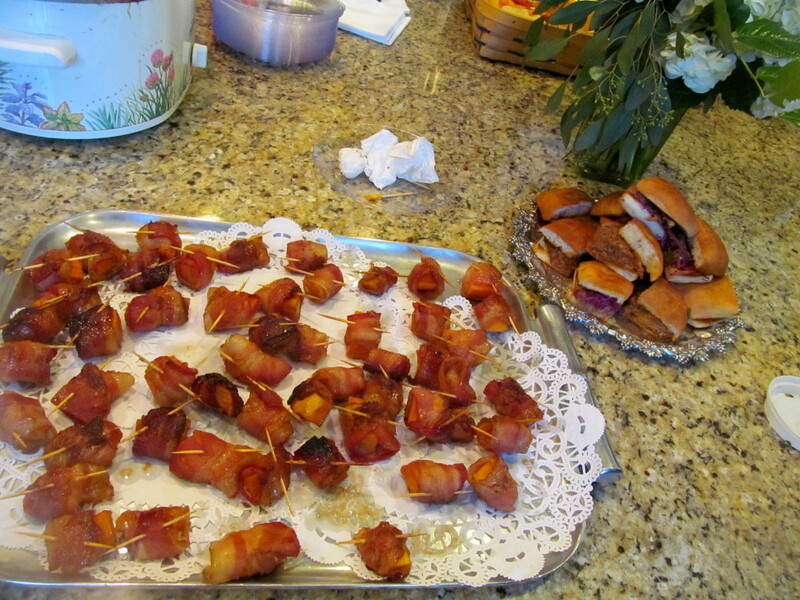 Those are bacon-wrapped sweet potatoes and pulled pork sliders! That cheesy potato bread on the bottom is a Peruvian specialty! Andrea’s sister’s boyfriend’s mom (whew!) made those fabulous spinach feta puffs, and the groom’s dad whipped up that life-changing buttered rum cider. Seriously one of the best winter drinks I’ve ever tasted! 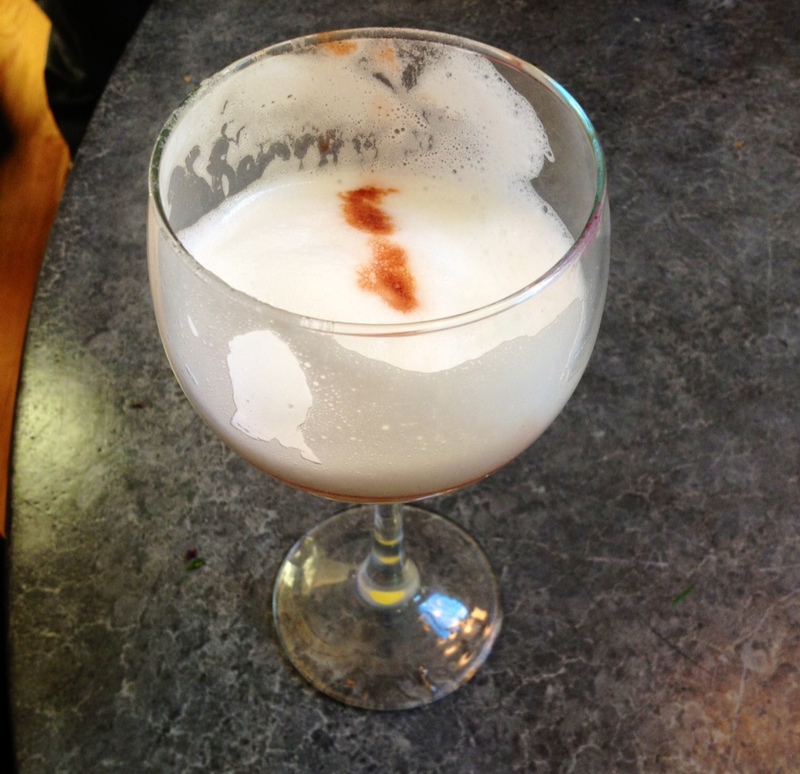 My second drink, perfect for a Peruvian wedding – Pisco Sour! I got to see several old friends I hadn’t seen in too long, including some kids I used to babysit for that are so grown up now…seriously, one is in college! Where does the time go! 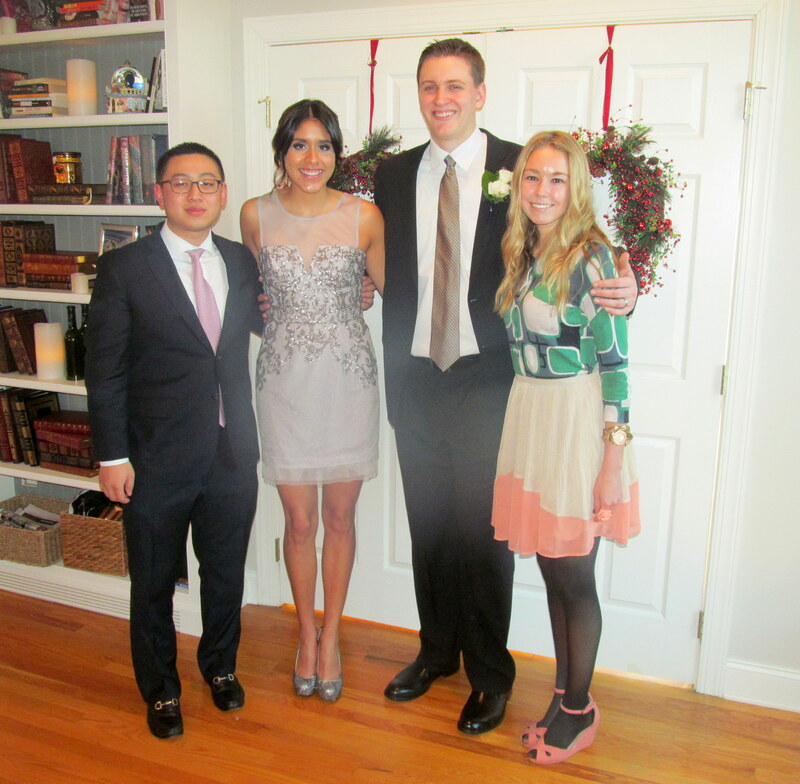 Of course Hong was there too to wish Andrea well! I snuck upstairs pre-ceremony to take a peek at the bride while she waited in her “hiding spot”. Seriously breathtaking. Andrea wore a gorgeous BCBG dress and she got her hair done at Strand, a new salon in town. They did a fantastic job! 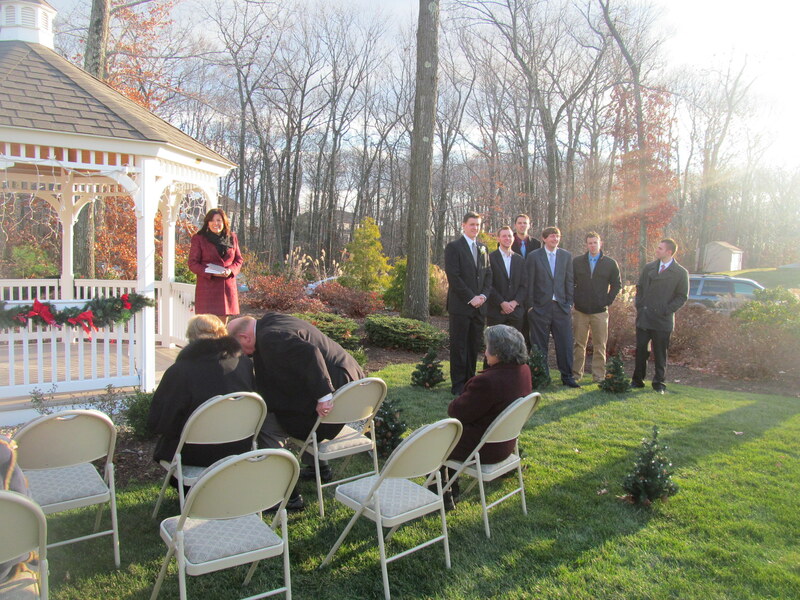 The ceremony itself was quick and to the point, probably partially because of the chilly temperatures! The guests assembled around the gazebo in Zack’s family’s backyard, and the groomsmen were ready and waiting. I debuted the H&M coat I got when I went to Boston to visit Molly! We formed an “aisle of people” and Mrs. Bohling and Mrs. Amado (“the moms”) walked out arm-in-arm, followed by Andrea and her awesome dad. There wasn’t even any romantic music playing like there was during the last wedding I bawled at, but man oh man this was when the waterworks started. I’m embarrassed to say I was definitely the most sappy guest in attendance. The father/daughter dynamic ALWAYS gets me and I know how proud Mr. Amado is of his daughter. He works hard for his whole family and wants nothing but happiness and success for them. I’m sure it was a huge moment for him to “give his daughter away” at the end of that aisle. Andrea hands the bouquet off to her sister and maid of honor, Claudia. The Justice of the Peace who married Andrea and Zack was none other than Susan Karp, the mother of one of Andrea’s close friends from high school. How awesome is that?! 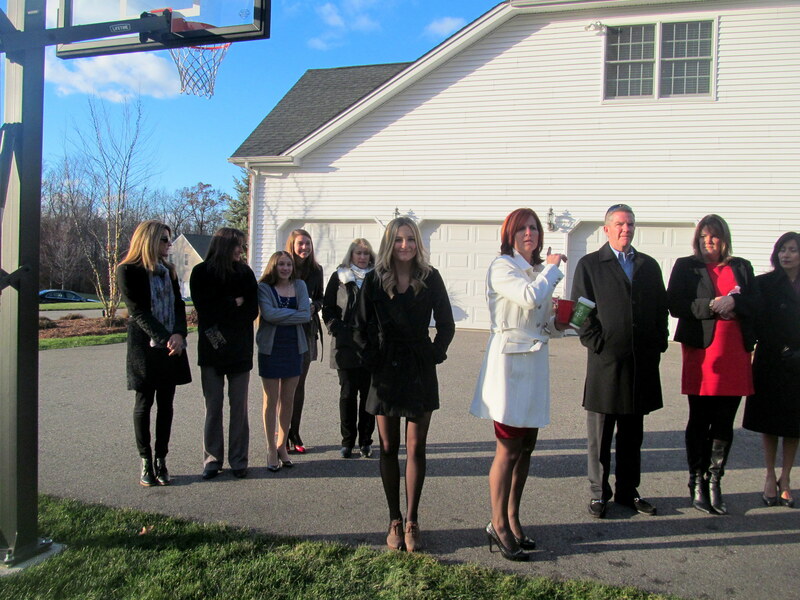 I again lost it during the part of the ceremony when Mrs. Karp mentioned watching Andrea grow up over the years. I’m sure that the moment she and Andrea met, neither of them could have ever guessed that one day Mrs. Karp would be officiating Andrea’s wedding ceremony! Hearing Andrea and Zack exchange vows was so romantic and though I didn’t catch a picture of their first kiss as husband and wife (at that point I’d put the camera away to just enjoy and take it all in) I have to say that kiss was seriously one of the most passionate and heartfelt I have ever seen. Andrea’s fur coat was so Old Hollywood! After the two were pronounced husband and wife, some photos were taken outside and then everyone hurried back indoors to enjoy more food/beverages and congratulate the couple! I’m so thankful to Andrea for inviting me to be there to witness the most special day of her life. As I wrote in her card, I still remember the first time I saw a photo of her and Zack tagged on Facebook (yes that is how this generation is remembering things nowadays) and wondered, “Oo who is this guy? !” And a few years later, I was watching them get married. I still can’t believe it! 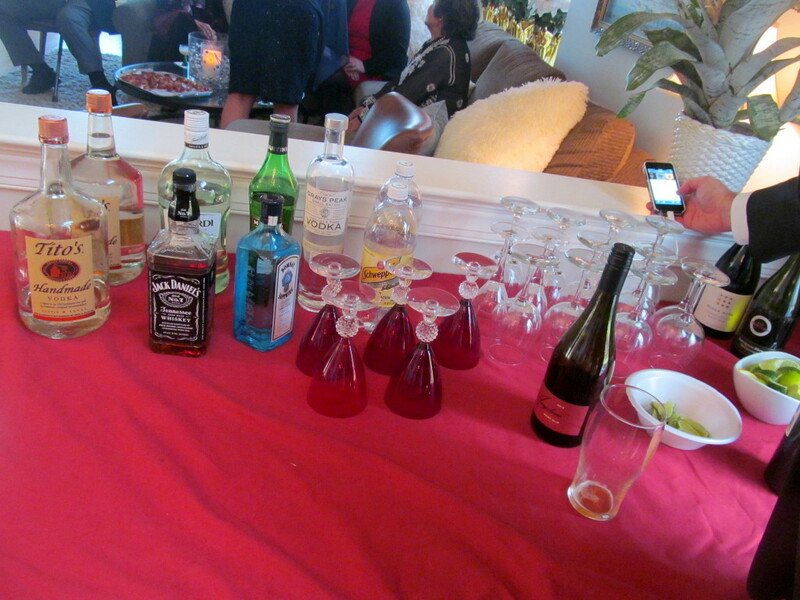 At my family’s Easter party in 2012! 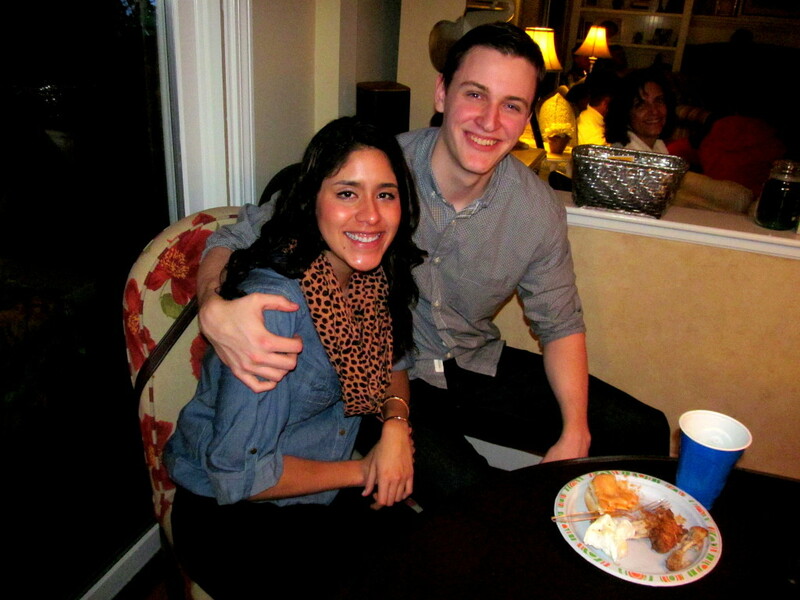 At this year’s Super Bowl party! In a year or two Andrea and Zack will have the big fiesta they are working toward, complete with the white dress and the open bar reception 😉 but for now, they will live it up in their own wedded bliss and happiness. Congratulations to Andrea and Zack! 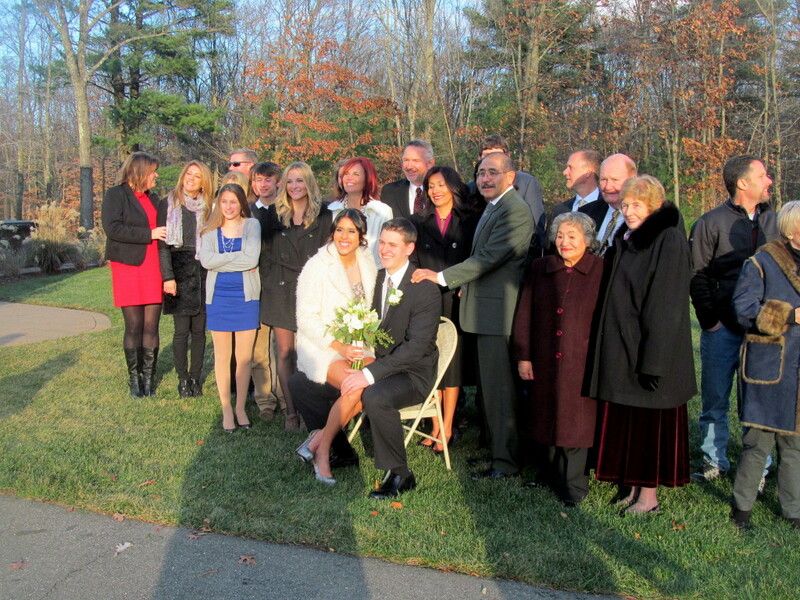 Have you ever attended a small wedding ceremony? 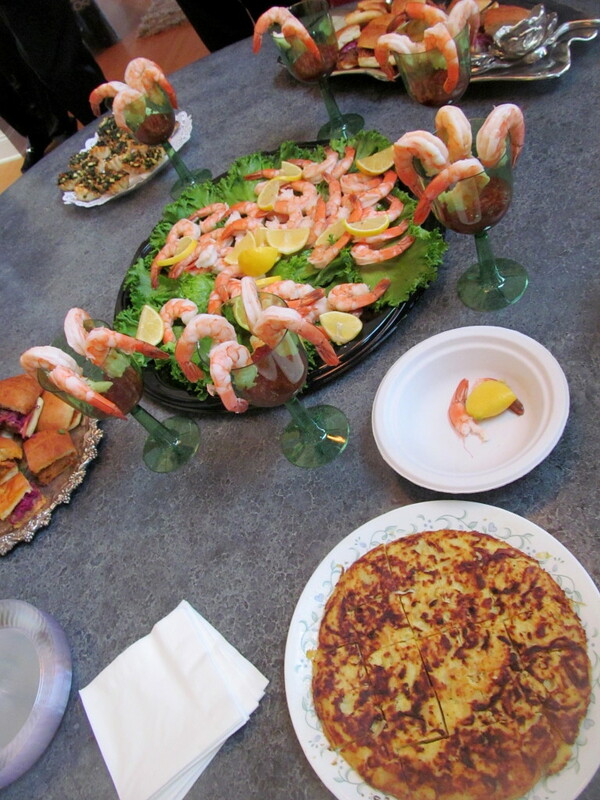 Check out that wedding food…what looks best to you? 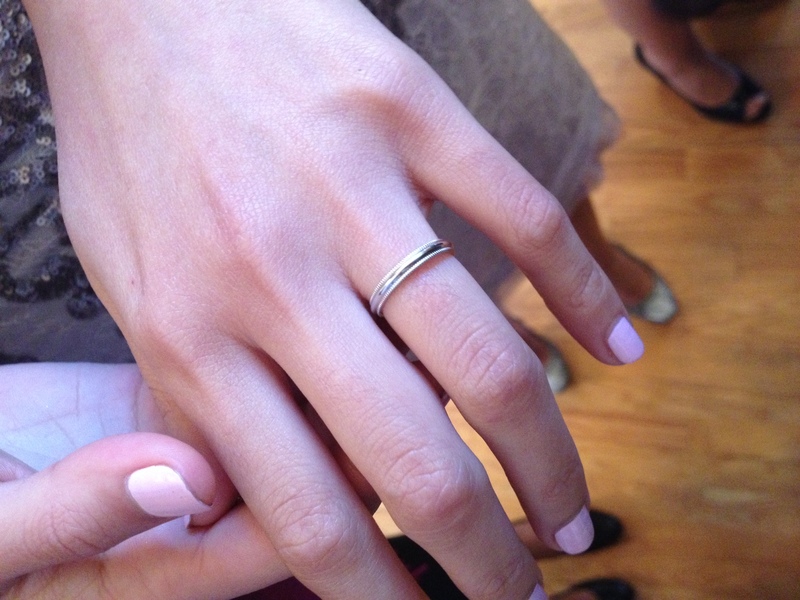 Have you gotten the chance to watch any high school friends get married?